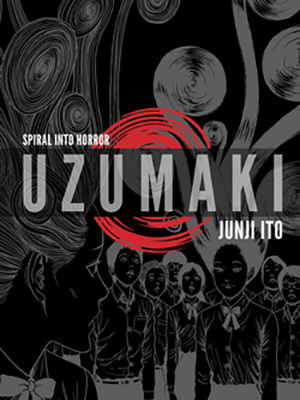 There’s a scene in Uzumaki, Junji Ito’s much-lauded horror series, that I think best exemplifies his particular style. The overarching story involves a secluded village in Japan whose residents become obsessed with spirals and usually meet grotesque and destructive ends as a result. In the third chapter, a scar on a teen girl’s forehead turns into a spiral black hole of sorts, eventually consuming her entire body. A horrific reveal shows the spiral hole extending back into her head, her right eye sitting gruesomely on the edge of her face. Then, in a series of smaller panels, the eye starts to roll back towards the vanishing point in the back of her skull.